This page serves as the jumping-off page for my web pages on highways. Since 1998 I have built a major site on Minnesota's highways...the Unofficial Minnesota Highways Page. This site is a broad overview and history of Minnesota's highway system, from 1920 to the present. In 2003 I debuted the Unofficial New Mexico Highways Page. While this is not as detailed as the Minnesota page, it provides an overview and route listing of New Mexico's historic and present highways. Finally, I have a longer term project in mind: a plan for reforming the U.S. Highway System. This site will list proposed deletions, additions, and renumberings of the U.S. Highway System to bring it into the 21st century, restore to some extent the numbering pattern that was originally envisioned in the 1920s but that has been relaxed, and reflect current travel patterns. I never knew it until I began searching the Internet for information on the subject, but I'm a road geek. Well, I knew what interested me, but it never had a name before. Always have been; as a kid, I drew pictures of roads and created maps of mythical places. Never grew out of that. Thanks to the Internet, those of us with this rather esoteric interest have found each other and can exchange data and stories. Admittedly, I'm a bit older than the average road geek, but there are a few of us "road geezers" around. In putting together the Minnesota Highways Page, I drew on 25 years of living and driving in Minnesota, where I moved in 1977. Previously, I had lived six years in New Mexico (where I went to graduate school) and grew up in southern California. Now, my wife and I have lived since 2002 in Pueblo West, Colorado, where I am employed as an environmental scientist (DON'T call me an environmentalist) for the local electric utility. This is me at exit 196 off I-80 in Wyoming, just west of Rawlins. 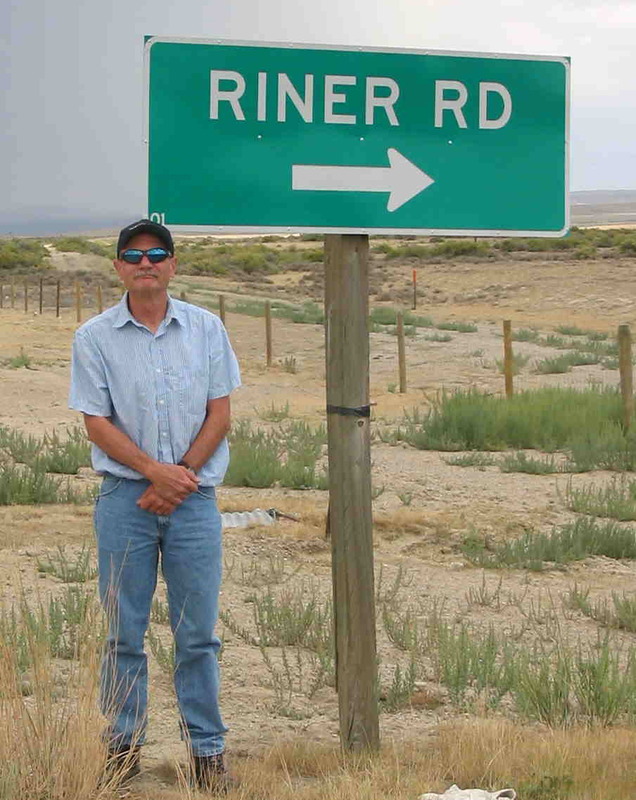 The road is named for the tiny town it connects to, which in turn is named for John Alden Riner, my great-great uncle. He was a U.S. District Court judge in Wyoming in the late 19th century and later mayor of Cheyenne. "Corporations have been enthroned, and an era of corruption in high places will follow, and the money power of the country will endeavor to prolong its reign by working upon the prejudices of the people until all wealth is aggregated in a few hands and the Republic is destroyed." Abraham Lincoln, 1864.